Mac OS X 10.5 Leopard comes with many interesting features. Some are obvious, some are more obscure. One of the obviously obscure ones can be found in the screen saver options. Like most modern computer screen savers, the one in Leopard is not inclined to save your screen, but it is pretty and flexible. Tell it to use your Pictures folder and, if you have an iPhoto library full of photos, things get interesting. 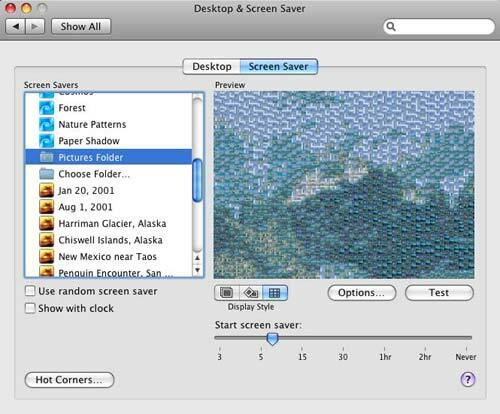 First, go to the System Preferences pane for Desktop & Screen Saver, select Screen Saver, and select the Pictures Folder screen saver. Mac OS X 10.5 Leopard System Preferences pane for the Screen Saver. The third option tells your Mac to make on-the-fly mosaics from the photos in your iPhoto library. You can vary the number of rows in your mosaic (more rows require more horsepower, but also look better) and the speed at which the Screen Saver moves the photos around. The effect is startling. Naturally, the effect on an iBook G4, which doesn't even have a video card, is much less impressive than on a multi-core Mac Pro. But "much less impressive" is a matter of degree: it is very impressive on either. Rather than even try and explain the effect, take a look at the QuickTime movie, below. This was captured using Ambrosia Software's Snapz Pro X. Hesitations in the video clip are due to the capture process and the compression process used to scrunch the resulting file (328.5 megabytes) down to something suitable for the Web. 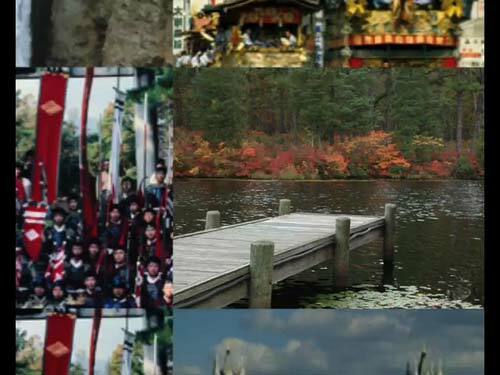 While your Mac is running the mosaic screen saver, everything looks very sharp; the artifacting seen in the clip is not present. Click on the illustration to launch the video clip. The clip is 13.2 megabytes, compressed via QuickTime Pro as an H.264 MPEG-4. Artifacting in the clip is due to the compression; when the screen saver is playing on the Mac in Leopard, it is much smoother and crisper. The clip is 640 x 480 pixels, and 3 minutes, 35 seconds long. 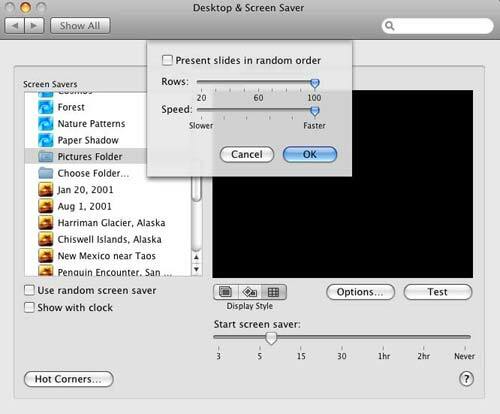 The screen saver on your Mac, on the other hand, is whatever size your screen might be, and lasts as long as your attention span. Admit it: you're impressed. And this isn't even one of the useful functions in Mac OS X 10.5 Leopard.